There was a shadow in the far-left corner of her eye. He’d been there for as long as she could remember. She’d been trying not to look at him for just as long. She didn’t know what would happen if she looked. She only knew that whenever she came close, she was overwhelmed with a sense of all-consuming dread. The shadow wanted her to look at him, but that only increased her certainty that she shouldn’t. She knew that he wanted her to look at him because he’d told her. He hadn’t started talking to her until she was twelve. The Princess did not reply. She did not even deign to acknowledge that she’d heard him. She thought that acknowledging him set a bad precedent, and started down a slippery slope toward looking at him. Setting firm boundaries was important. He was quiet, most of the time. Maybe he thought that if he didn’t say anything, she would forget he was there, and look. When she needed to look to the left, she closed her eyes first, and turned her whole head. The Court thought that it was charming, and looked demure. Her sleep was dreamless, and so there could be no shadows. She didn’t speak much in crowds, for fear that she’d lose track of whose voice was whose. The Court thought that she was shy. When she was sixteen, a man who wanted her to marry his son gave her a fairy pony. It could stand in the palm of her hand, with a coat made of moonlight and a mane of sunbeams. Its eyes were all-seeing, and it spoke only truth. She waited until she was alone to try talking to it. “Is there something in my eye?” she asked. “Do you think there’s something in your eye?” the pony asked. “So there might be something in my eye, still?” she asked. “You’re a very nice pony,” she said. “They do,” the pony agreed. “You’re really very pretty,” the shadow whispered. When the Princess was seventeen, she went on a quest to catch a unicorn, to improve her marriage prospects. She did not actually care for the idea, but there was a witch in the Wild Wood, and that interested her a great deal. The unicorn was just an excuse, and it made the King happy to see her showing some initiative. The Queen had kept a unicorn, before she was the Queen, and the King had always been very impressed by it. “It wasn’t actually a unicorn,” the Queen confided while she helped the Princess pack. “It wasn’t?” She looked at the fairy pony on her armoire, who nodded. “Are there many doves in the Wild Wood?” the Princess asked, tucking a red ribbon into her pocket. “I think that you can catch a unicorn,” the shadow whispered. Traditionally the Princess would go on a long journey, meeting wondrous things along her travels. Some of them might have been witches. But the King thought a unicorn was wondrous enough, because when her initiative had been purely hypothetical it had not involved so much actual risk. So she took a carriage to the edge of the Wild Wood, and did not meet any secret witches disguised as travelers along the road. The Princess did not mind. She preferred to meet a witch on her own terms. The Queen packed her a lunch, and snacks, a spare cloak in case she got cold, and an ugly old pair of boots less likely to blister than her nice ones. The Princess was very sure that she would be just fine in her nice boots, but the Queen packed the ugly ones anyway. It did not take the Princess long to realize that the Queen had been right, because when the pinch at the arch of her foot had been purely hypothetical it had not involved so much actual pain. She sat on a fallen tree, and tried not to look at the shadows. Only one of them was at the far-left corner of her eye, but she’d never been in the Wild Wood before. The shadows here were blacker than the ones in the castle. She followed the trail to the east, because that was where the forest got darker, the canopy of leaves blocking out the light. She did not know for sure that unicorns preferred the light, but it seemed plausible enough. It would be just her luck, she supposed, to go looking for a witch and find a unicorn instead. She walked until the trail grew thin, and she could only assume that it was still a trail at all. The sharp edges of leaves caught on her skirts, and mud crawled into the gaps in the stitches of her boots. She left a trail of silk scraps, purple flags fluttering in the branches of the trees that had claimed them. The sun fell, burned hot and blushed pink before disappearing behind a mountain she could not see. The moon rose. The Princess was not tired. She was a little hungry. She didn’t stop to eat, anyway, because she did not know how long it would take to find the witch in the Wild Wood. She did not know for sure how many adventurers had been undone by their own stomachs, but she did not want to be one of them. Neither did they, if she had to guess. She found the little cottage in the middle of an empty grove, the smoke that rose from the chimney heavy and white and smelling of sage. She could think of no one who would live in such a house but a witch. The Princess knocked on the door, and waited. After a moment, the witch answered, though at first she looked too low. “You’re very tall for a princess,” the witch observed. “I think you’re just the right height,” the shadow whispered. “I take after my grandmother,” the Princess explained. “May I come in?” She didn’t actually know if a witch outranked a princess, but it seemed safer to assume. “You may,” the witch said, appreciative of her manners. The Princess sat by the witch’s fireplace, in an old wooden chair with a mug of something bitter. She didn’t know if she was supposed to drink it, but it kept her hands warm in the meantime. “Did you want a love potion?” the witch asked. “Why would you?” he asked. “Do you have any?” the Princess asked. The witch leaned closer. The Princess turned her head to the right, so that the left-hand corner faced the witch. “You’ve got a shadow,” the witch said. “You can see it?” the Princess asked. “I can see that it’s there,” the witch said, which was not quite the same. “How do I get rid of it?” she asked. “I told you,” the shadow said. “You tell it to go away, I suppose,” the witch said with a shrug, holding her own drink. “Maybe if you’d look at me, you wouldn’t want to,” the shadow said. “Does that work?” the Princess asked. “That isn’t a solution at all,” the Princess protested. The Princess found this answer highly unsatisfactory. “Can’t you get rid of it for me?” she asked the witch. “I’m right here,” the shadow said. “Can’t you make it your business?” the Princess asked. “I won’t eat you,” the shadow said. “I’m trying to deal with it,” the Princess said. “They’re not mutually exclusive,” the Princess said. “Part of growing up is learning how to take care of things on your own,” the witch said. “Knowing when to ask for help shows a lot of maturity,” the shadow said. “What about a devil?” the Princess suggested. The Princess trudged back through the Wild Wood, and she nibbled on a cucumber sandwich that the Queen had packed. The Queen had a lot of experience with walking great distances in very nice shoes, but very little experience with being hungry. Fortunately for the Princess, she took two steps into a pond that she had not noticed in the dark. That was not the fortunate part. The fortunate part was the apple tree sitting beside it, whose fruit was so vibrant a red that it glowed. The Princess picked an apple, and buffed it against her sleeve before taking a bite. The crunch echoed against the trees and stuck to the edges of her mouth. She heard a soft huff of breath, and looked across the pond to see a unicorn. It looked, if she was honest, a lot like a funny goat. Its coat was made of silver, and its mane was spun rainbows. She held the apple out towards it. “Did you want some?” she asked. It stepped across the pond, hooves leaving small ripples across the unbroken surface. The bite it took of the apple was much less dainty than hers. The Princess took the red ribbon out of her pocket, and tied it around its neck. “I knew you could catch it on your own,” the shadow said. The Princess lead the unicorn out of the Wild Wood, and it rode with her in a carriage back to the castle. She changed back into her nice boots on the way. The King was very impressed. The Queen said nothing about the boots, and the Princess said nothing about the cucumbers. “She’s very pretty,” the fairy pony said of the unicorn. “Is it a girl?” the Princess asked. “Would you really rather summon a devil than look at me?” the shadow asked. So the Princess waited for a day that was just a little too cold, and she went just outside of the palace garden. It was the part that no one looked at, and so no one trimmed it. There was a pile of trimmings in the corner that had been thrown over the wall, and a puddle that had been there long enough that frogs lived in it. She sat with her legs crossed, and tucked the ends of her dress beneath herself, and waited. Frogs croaked and sang and burrowed in mud and slime. Eventually, a fawn emerged from the puddle. Its coat was made of void and starlight, and its eyes were shining white pearls. The grass beneath it was unbowed by glass hooves. It stared at her, unblinking. “Are you from Hell?” she asked the fawn. Slowly, it dipped its head low. “Girls who dally with devils get hooves,” he warned. The devil came closer, and the Princess reached out a hand. Its nose and the stubs of its horns were both velvety, and she scratched it behind the ears. Slowly, the devil stood on two legs. The other two it rearranged into arms, with slender hands and glass fingernails. Strands of glass curled in ringlets around its face. The shadow started to whisper again, and the devil opened its mouth with a cacophony of bells. The shadow quieted. “That does help,” the Princess said. “Thank you.” She stood, and offered her hand to the devil. It accepted, and she lead it back to her room to find it a dress. She decided on one that was small and white, because the devil was small and void, and the two seemed complimentary. Its glass hooves rang against the marble floors beneath the bell of its skirt. The Court did not know what to make of the devil, with its starlight freckles and pearls for eyes. They thought that it might be terribly fashionable. Some tried painting stars on their cheeks, but the effect was not quite the same. “Would you like us to get it its own room?” the Queen asked. “No, thank you,” the Princess said. “Is all of the hand-holding necessary?” the King asked. The Queen considered saying something. “That’s all there is to it, then,” the King said. The Princess squeezed the devil’s hand beneath the table. It sat beside her, unblinking. It squeezed back. At her eighteenth birthday party, the Princess and the devil danced. The Princess had not danced before. The King nudged the Queen in the side with his elbow. The Queen did not consider this remotely necessary. The band played a song that accompanied well the sound of hooves against marble, and sometimes the devil opened its mouth to chime bells. The Princess kept her eyes shut. On the night of her eighteenth birthday, the Princess crawled into bed with the devil, the way she had many nights before. The unicorn and the fairy pony slept at the foot of the bed. The devil pressed its velvet nose to hers, a question. The Princess nodded, and the devil kissed her eyelids. The Princess dreamt of a meadow. 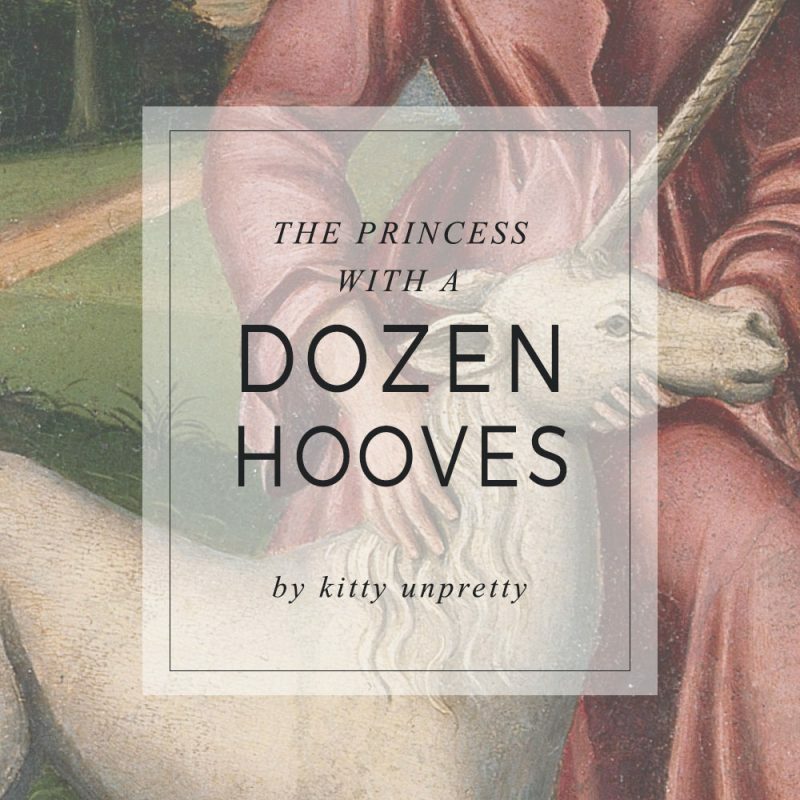 She sat with the devil, and admired her new hooves. “I don’t know how to be anything else,” it said. It squeezed her hand. She could see her reflection in shining white eyes. Its eyelashes were like butterfly’s wings. “Every time,” the devil said. It would be worth it, anyway.